The Blue Bar: An informal and rustic ‘Blue Bar’ was undergoing refurbishment. 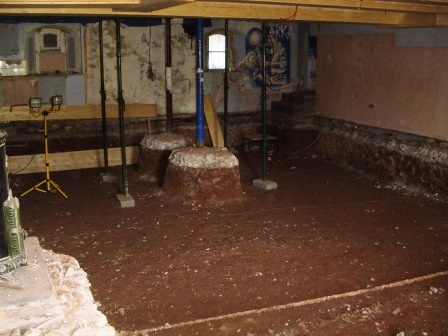 However work stopped when we decided the ceiling was too low and an ambitious project was started to dig down the floor level - by hand. Ultimately the old Blue Bar (formerly a poorly attended Jazz Club) will provide space for a separate bar, dining room and small meeting room with direct access on to the terraces overlooking Craig y Nos Country Park and Brecon Beacons at the rear of the building. 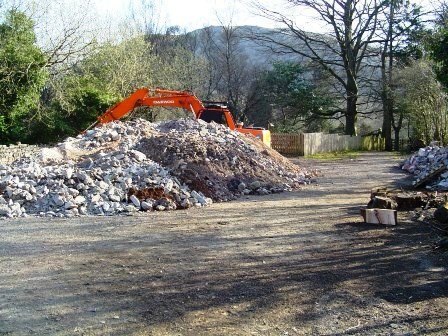 However this project is currently on hold - and has been since 2004! 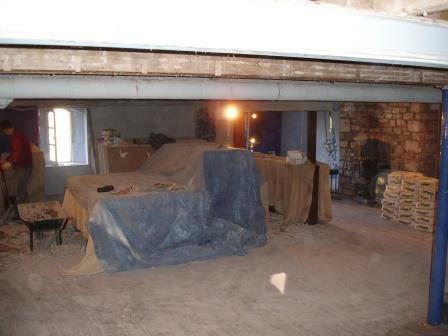 This interesting and cosy cellar room may one day become an evening restaurant catering for Brecon Hotel B&B guests at weekends, allowing wedding guests to be catered for separately in the main function rooms above. Currently we do not offer evening meals to non-wedding guests on wedding nights. In most cases the wedding couple are required, under our wedding offers, to fill all the accommodation with their guests. But we do have a number of smaller last minute weddings especially in the winter months where we have non-wedding guests staying as well, whom we cannot currently serve evening meals. This means we lose out on weekend D,B&B business and can only accept regular B&B during the weekdays Sunday to Thursday and on winter weekends when there is no function on. As weddings and functions invariably disturb the peace of guests coming here for a holiday break, we've so far avoided merging B&B business with the weddings. We, along with our guests, prefer to keep the two sides of the business separate. With no non-wedding B&B guests able to stay overnight on exclusive wedding bookings, there is little to no overlap between wedding guests and ordinary B&B guests. Keeping the two as separate as possible means we can concentrate on the wedding exclusively, or on servicing B&B guests properly without the distraction of an event. However this can affect our income flow for as we are getting more smaller weddings, we now do need to accept non-wedding B&B to fill rooms not used by the wedding. We do need to open up a separate restaurant for B&B guests. This would need to coincide with opening up six more en-suites in the main building so we have enough rooms overall. Our predecessors, probably in the Hospital era (1920-1980) and maybe soon afterwards, had used 'incorrect' methods. It was once the fashion to use concrete pointing that stuck out 'flat' beyond the stones. This would then catch water on the edges of the exposed pointing, the water would freeze in winter, chipping away at the exposed concrete till some of it dropped off. Eventually the walls would fail with more water trapped inside the wall, unable to drain out, freezing and swelling the wall and cracking off more concrete pointing and trapping more water inside the walls. We have had a couple of sections of garden wall collapse (one section while someone was watching) due to this erosion. We have lined the ends of the new wooden joists with a rubber coat to prevent the ends getting wettened by the stone walls. However this can present problems as new wood will have some moisture in it, and may 'sweat' within the rubber coat. So the ends can still rot over the years and dampness within the joist can cause dry rot too. All this means that in a building like this which won't willingly remain dry, joists are vulnerable to rotting every 20-30 years or so. 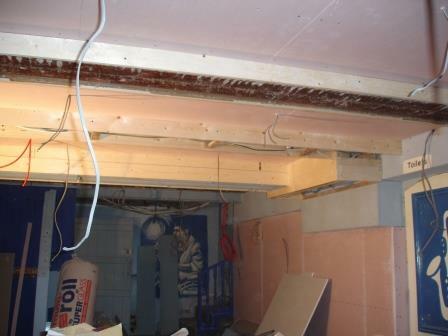 So during a slack January and February in 2006 we replaced all the floor joists. 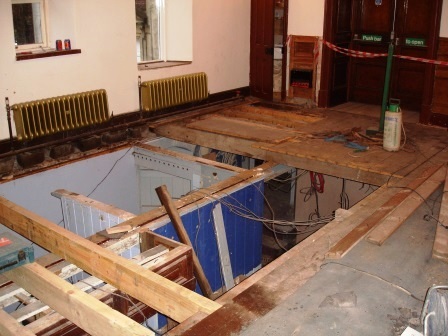 This had to be done throughout the ground floor - the function room, Patti bar and even in the kitchens, from which all the equipment had to be removed so we could replace the floor joists and put down a new floor. We have the same problem on the derelict areas, where we suspect many joists are now rotten. 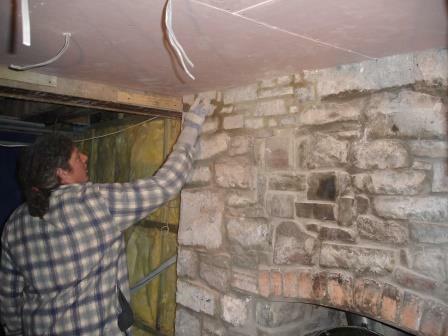 Every single floor and wall will need taking back to the stone and re-constructing. All this is far more expensive to do with an old building in constant use than with a new-build. Though nothing can be seen for this work, it was quite major and took 8 - 10 weeks each winter over three years. We now have a new ceiling with recessed spotlights in what was the Blue Bar. It just needed a lick of paint to be ready for use. We then decided the new ceiling was too low. Actually my mother visited and said it was too low. Anyone over 6 feet would hit their head on it. 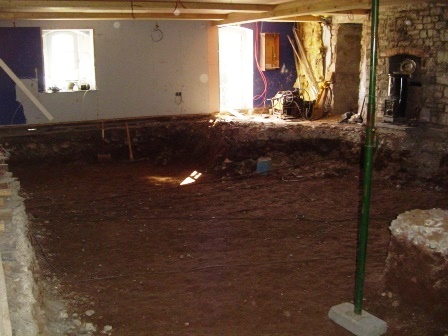 So we excavated the floor, dropping it by three feet - something my parents had done many times in old historic houses they restored, but never on the scale required at Craig y Nos. The digging and carting was done by hand, two Slovakians and hundreds of wheelbarrows. 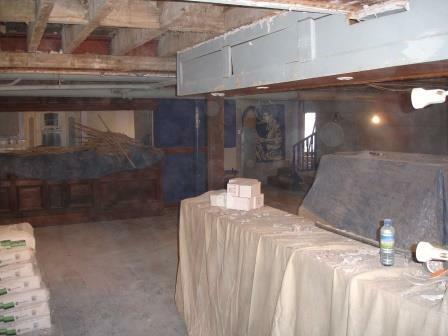 Most of the ceiling joists supporting the room above, the heavily used Music Room and main Function Room, were rotten. Some attempt had been made to sort this out in the past by adding steel brackets to support the rotten beams where they connected with the wall. 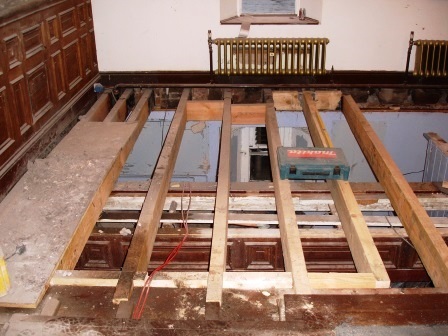 This is a solution but not as long term as replacing the joists with new ones. 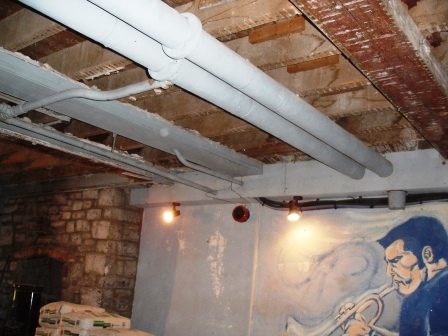 Because limestone walls were designed to absorb water and then dry out, there is an inherent problem in the building's design, where the ends of the joists rot after a few years. We also decided to increase the room's height, which could only be done by lowering the floor. As we could not get any equipment in to this area, we had two Slovakians spend over a year of hand-digging, on and off, between other jobs. 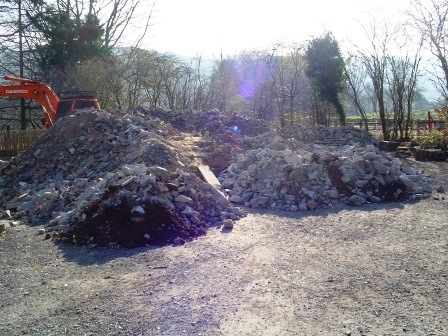 The floor of the old Blue Bar formed a pile of rubble in the rear car park that eventually took eighteen 20 ton truck loads to clear. The initial question was – how far could we dig without undermining the foundations? Test holes were dug and duly inspected by a structural engineer. Work has temporarily been shelved as this has proved a more involved project than we realised. We also need to upgrade the loos as part of the work to this end of the building. I decided more function rooms were needed ahead of smarter loos. So first we moved on to the sports room, around 2005/6, when I bought the hot tub and had nowhere to house it. Then priority was given to the restoration of the Conservatory (2007/8) to create a large second function room for events. 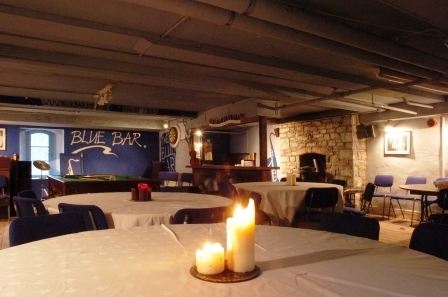 Our Blue Bar / cellar restaurant has taken a back seat for ten years now. Once completed, the Cellar Restaurant can be used as a breakfast area, and as a separate dining room and restaurant for B&B guests not part of a function, and by day it can be used as tea rooms. We once had a busy trade as a tea-room, with loads of people visiting the Country Park dropping in. It was not especially profitable but did have the effect of bringing more people into the castle, which had a knock-on effect on our event bookings. Now the Country Park has their own tea rooms and has captured our trade, but in the summer they are too busy. We've heard some complaints about quality of food and service (a sign of excess demand straining the facilities) and it is time we offered an alternative. We will probably tackle this room in 2020, sixteen years after the project was begun. At the same time we can upgrade the theatre loos. These loos are the main cloakrooms for the castle function rooms and restaurant and are old fashioned and scruffy. The new loos will be smaller and will be split so half serve the theatre and function room and half service the new Blue Bar restaurant. We have a beautiful set of loos and changing room in the sports room, but a shoddy set of public loos serving the function room and theatre. While they work and are adequate, people these days are accustomed to visiting much smarter cloakrooms. We could easily spend another £100k in this area, which seems a lot for some nice loos and to finish off the restaurant - and that estimate could easily increase by 50% (everything does in practice). Hence it keeps getting shelved and at time of writing this (23/05/2017) we've opted for a quickie make-over of the theatre loos, so they'll last for a few more years without any substantial change. We'd found the Blue Bar dining area to be too small when in use as a daytime cafe and the loos too large. So as part of this fairly major refurb, we intend to expand the existing Blue Bar into some of the space occupied by the loos. There remains at least 3 months work to do here, with 'everyone' on the task, during which time we will have no loos for the function room - so this work needs to be done in winter when we have few events on.